Our in-house critic, Wilfred Okiche, was invited to the International Film Festival Rotterdam and is sending dispatches from the front lines of global film, enjoy. In present-day Lebanon, Zain, a street-smart kid is brought into a courtroom, facing charges of stabbing an adult. On interrogation, he reveals he wants to sue his parents. Their offence? Bringing him into a world of hardship and difficulty. So begins Capernaum (aka Capharnaum), the powerful Cannes Jury Prize-winning third feature by Lebanese director/actress Nadine Labaki. Zain has the terrible fortune of being born to negligent migrants fleeing the violence and destruction in their home country of Syria. As a result of the lack of leadership he is exposed to at home, Zain has learned at an early age to take care of himself and his countless sisters. Labaki’s screenplay (written together with Jihad Hojaily, Michelle Keserwany, Georges Khabbaz, and Khaled Mouzanar) depicts this forcefully in scenes where Zain runs errands for a local benefactor, just before trucking heavy bags of food items up a series of winding steps, all in a bid to provide for the family. His relationship with sister Sahar uncovers his emotional, sensitive side. Using a series of lengthy flashbacks that at times recall Danny Boyle’s Slumdog Millionaire, Capernaum traces Zain’s journey to the point where he is forced to denounce his parents. In his short time on earth, he has lived through several lifetimes of trauma. Capernaum is unrelenting when it is listing out all the ways that Zain has been failed not only by his parents but also by the society he has been unfortunate to be born into. These scenes of dysfunction are heartbreaking but never manipulative, and Labaki’s direction is assured enough to present several horrors of the human condition without exactly badgering her audience into submission. When the tears come- and they will- it is an almost cathartic, slow release. Capharnaum (which according to the Merriam-Webster dictionary means a disorderly accumulation of objects) concerns itself primarily with the physical and emotional horrors of wars and conflict as experienced by the defenseless. Through the brutal lived experiences of Zain and Yonas (Boluwatife Treasure Bankole), an infant who comes under Zain’s care after he flees home, Labaki effectively and devastatingly drives home her point. Capernaum avoids any direct mention of the political situations in Syria or Ethiopia that have stripped the parents at the film’s center of all dignity and sent them to Beirut’s slums where everyday living is an extreme struggle. 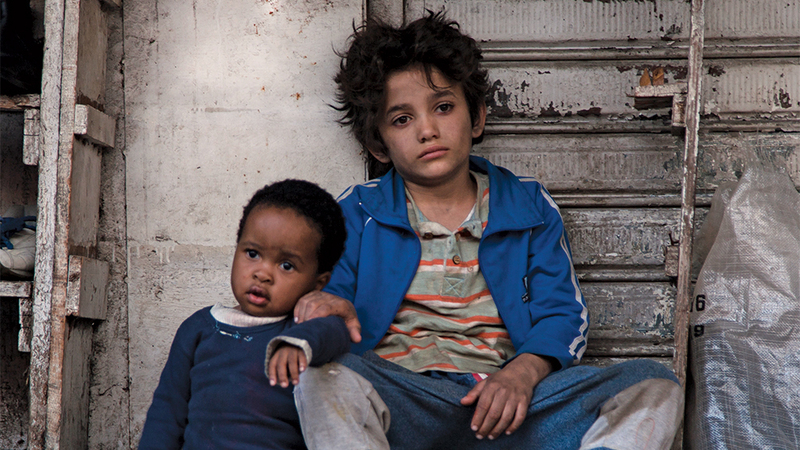 Shot in a gritty style with shaky camera movements and raucous noises depicting the chaos of life on the streets, Capernaum is a shrewdly observed- and edited- piece of socio-realism that is unsparing about the big issues it highlights. The beauty and ugliness of Beirut’s mean streets are vividly depicted and Labaki deserves kudos for assembling a stellar cast of players with no acting experience but who are united by their real-life closeness to the situations that the film depicts. Labaki casts herself in a tiny role as Zain’s lawyer. Zain Al Rafeea who plays the lead character, named after him is a revelation. Cocksure, swaggering yet vulnerable, Al Rafeea gives an unforgettable performance that belies his age and experience in front of the screen. It is a performance that seems natural and unforced but Labaki’s hand is never far away, clearly modulating the emotions to ensure there is no cheap melodrama. This climaxes in the brilliant final shot that is both jubilant and heartbreaking at the same time. Labaki also does some magic by capturing the natural and endearing expressiveness of Treasure Bankole who is simply a delight to watch. Nominated for best foreign language film category at the Oscars, Capernaum is a triumph of filmmaking. In turns funny, difficult and angry, but always sensitive. Everyone should see.